It is a sweet summer treat and soooo super easy. Yesterday I found we had a big batch of strawberries end up in a super cold spot of the refrigerator and they partially froze. Partially frozen strawberries become very soggy squishy strawberries. We had to act fast to re-purpose them. Into the blender they went. Now what? 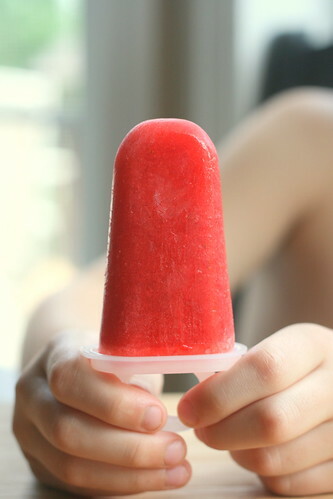 The kids weren't hungry for smoothies, so on to plan B: popsicles. Along with the strawberries I added just enough orange juice to get everything blending along. 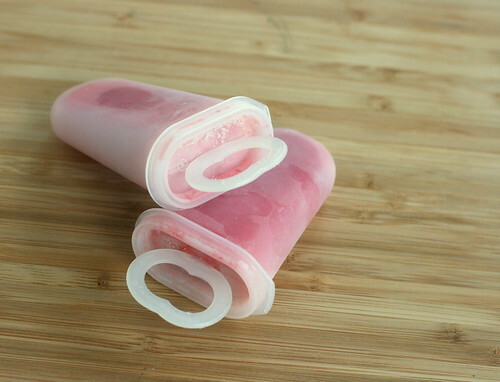 Then into popsicle molds and into the freezer they went. And they were a very big hit with the whole crowd. What are some of your favorite popsicle blends? This week's round of Muffin Tin Monday did not have a theme. And while I had some ideas float around in my head, in the end I was not feeling very inspired. I ended up making a breakfast tin. 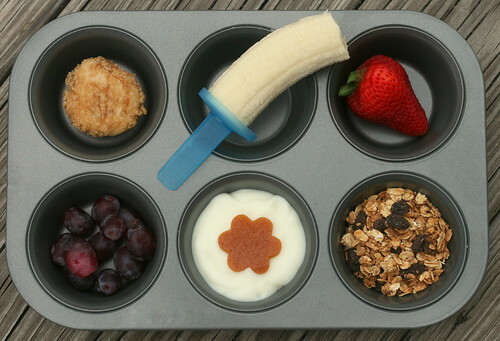 Across the top row: homemade raspberry crumb mini-muffin, banana pop, strawberry. Bottom row: grapes, plain yogurt with an apricot fruit leather flower, homemade raisin granola mix. The banana on a popsicle trick is total genius, but alas, I can't take credit for it at all. Alie showed off that bit of brilliance with her MTM post a few weeks ago! Isn't it fantastic?! Way to go, Alie! My girl Paigey-pie was so thrilled with it she bit off the end before I could take the picture! New bento box! 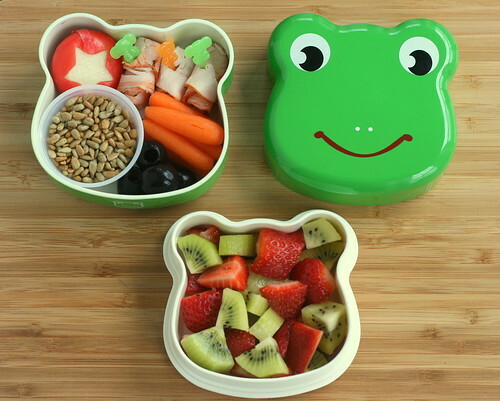 Toadally adorable bento box!! 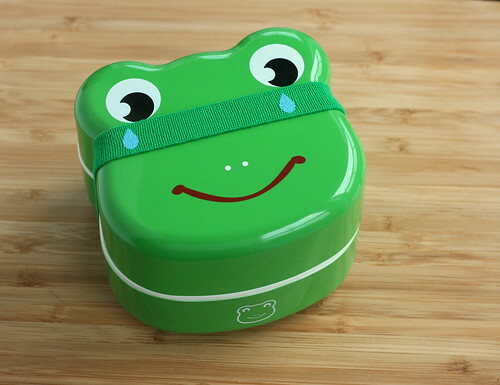 This is (one of) our new bento boxes. I might have gone on a bit of a bento-shopping bender lately. Maybe. Just Maybe. 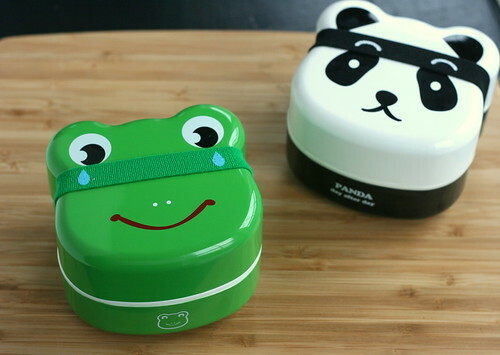 I have been pining for this little two-tier bento box for ages! I was unsure about the size and quality of it, so I've continued to hem and haw over it for the better part of a year. After seeing the price drop on it quite a bit on Amazon I started to waffle and when my friend Wendy did a post about getting the panda version I totally crumbled like a cookie! (although I just now realized when hunting up that link that hers is actually a little different than mine...I didn't even realize!). Whether this be a big snack or a small lunch, it was all for Ethan, my 8-year-old. 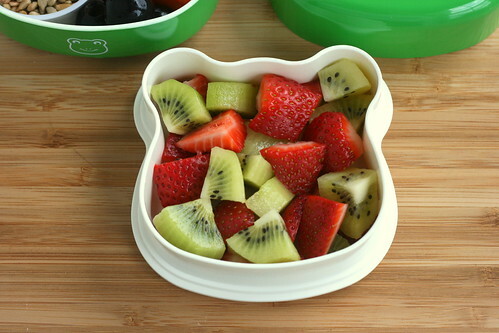 The top level was perfect for a little fruit salad of strawberries and kiwi fruit. 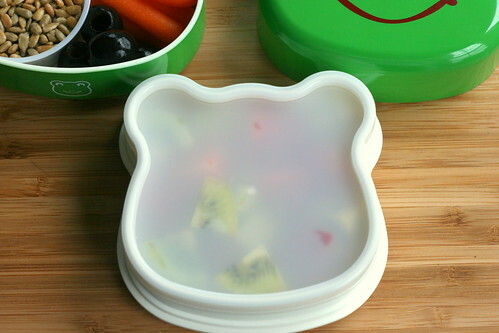 The top level comes with a nice sealing lid to keep wet things from making a mess! 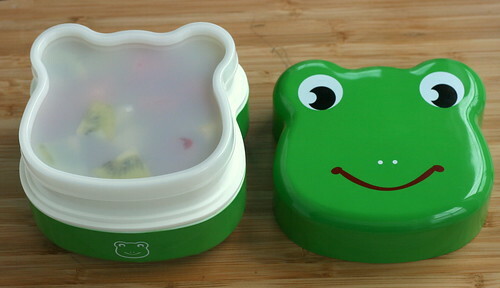 The top tier fits nicely on the bottom tier, and then the froggy face lid closes it up. A bento "belt" is an elastic band that keeps everything securely together. I just noticed there is also a piggie version too . Oh mercy me! 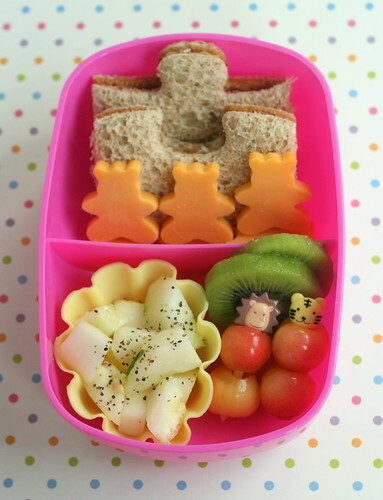 In the back section is a sandwich (peanut butter & raspberry preserves), with cheddar cheese bears. 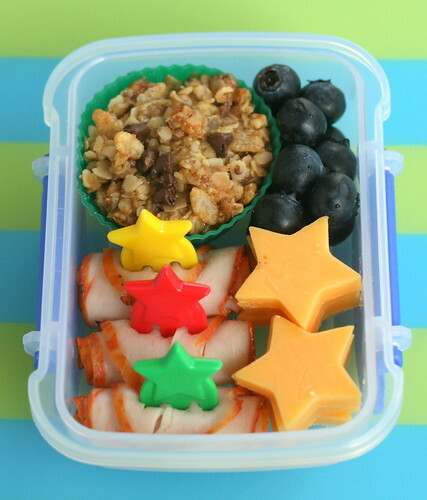 Baby carrots, strawberries in a silicone cup, crackers, the rest of the tiny cheddar cheese stars (extras from the other day's tiny snacks - so much easier to do a lot at once and keep them ready to go in the fridge! ), peppered turkey roll-ups on a pick, and a homemade granola bar. also needed but didn't make it in the picture (because I am just that scatterbrained)...vanilla, brown sugar, and ground flax seed and/or wheat germ (optional). 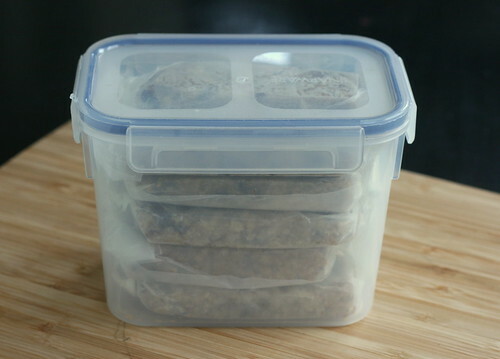 For granola bars you will need a baking pan and for the little "granola bites", as I call them, you will need mini silicone cups. 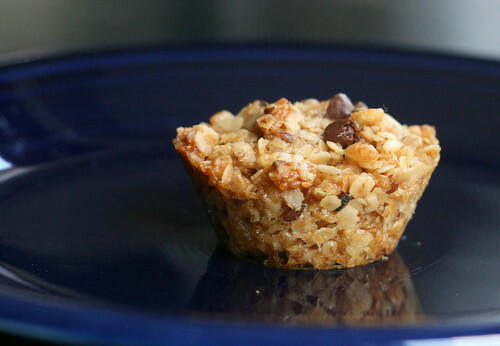 This recipe will yield an 8x8 pan of granola bars plus about six mini-granola bites. 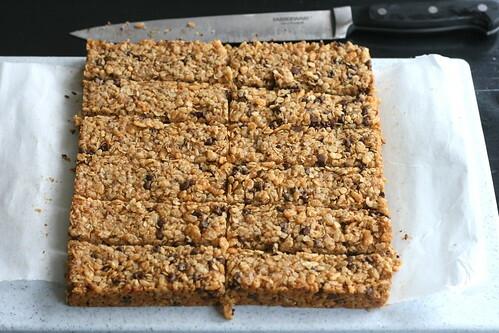 You can make all granola bites if you like, or all granola bars. 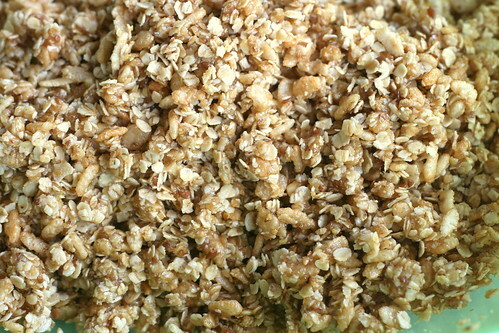 I wouldn't try making more than 6 of the bites if you are also doing the bars, because you may end up with not enough granola in the pan for enough depth to keep the bars intact once cut apart. I've also found through a lot of trial and error that the bars stay together better in a truly square pan, like this one, rather than a glass baking dish with rounded corners and edges. I use a piece of parchment to help get the bars out of the pan. I use the paperclips to keep the sides of parchment from flopping into the middle. I remove the paperclips after the pan is filled and ready to bake. * optional: ground flax seed and/or wheat germ (I use 3 heaping Tbs. or so of each). Mix all ingredients (except for the chocolate chips - keep those out for now) really, really, really well. I start with a wooden spoon and then usually end up using my hands too. Take your time to make sure everything is really blended. Taking your time also allows the wet ingredients to sort of soak into the dry components. If your mixture seems dry after mixing then you may need to add a little more oil and/or honey - a teaspoon at a time - until it starts to clump up a little. It may be hard to tell, but can you see how some of the granola mixture is starting to cling and ball up a little here? When your granola mixture gets to this point, not too wet, not too dry, then stir in the chocolate chips. 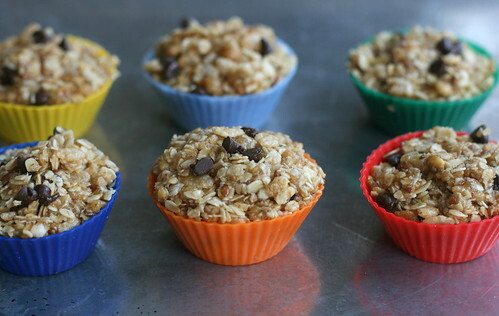 Holding the mini muffin cups, scoop the granola mixture in and form the mound compactly. I use a rounded tablespoon to help form them, a small cookie scoop would work too. 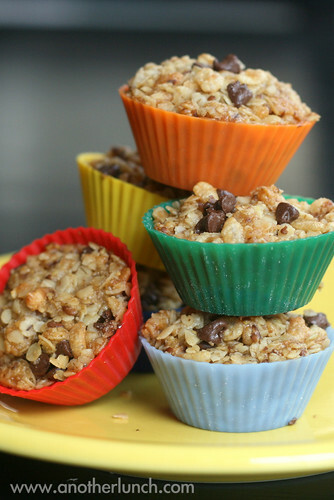 You need to use both hands to press the granola and support the muffin cup at the same time. Line them up on a baking sheet to place in the oven. 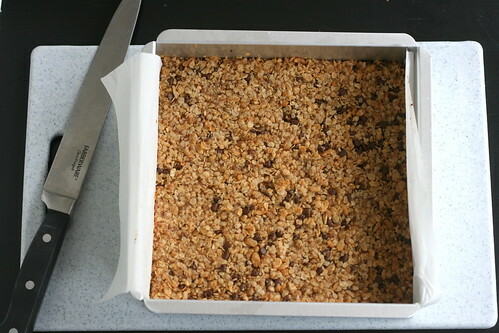 Press the remaining granola into your baking pan (if you are making bars). Make sure your baking pan has been sprayed well with non-stick spray! Press mixture firmly, compacting it as well as you can. 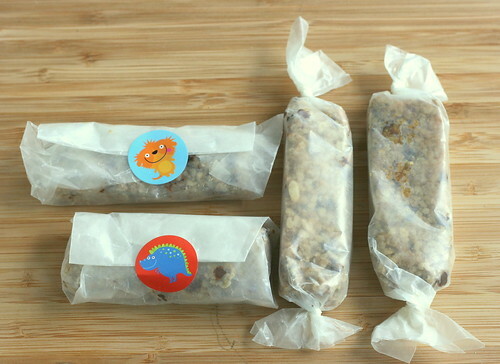 Granola bars: 17-22 minutes (keep an eye on them!). Let the granola bites cool completely. Just leave 'em alone for a few hours so they can set. Then, they are done! So easy. 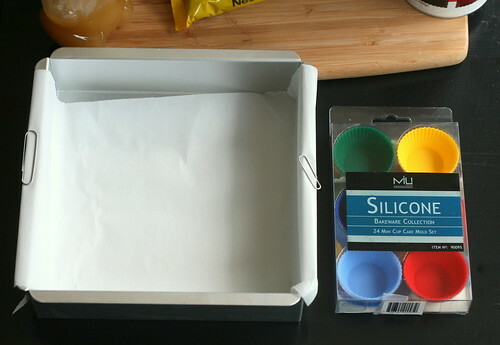 You can remove them from the silicone cups, if you want, they hold their shape great. The bars are a little more work. MOST IMPORTANTLY - do not even attempt to touch them at all after they are done baking. You must let them set and gel and have alone time. Overnight. I mean it. If you don't leave them alone overnight you'll be sorry! Take my word for it. I speak from experience. It doesn't matter if they seem cool to the touch and it doesn't matter if they "look fine". They really do need that time to come together and fully set or they will just fall apart. So, the next morning, you will need a long knife. It's a lot easier if you can cut them apart in one big motion. My longest knife is *just* barely long enough. Turn the pan over on a cutting board. Sometimes I get lucky and the whole granola slab plops out without further prodding. Sometimes it needs to be prodded. This is where having that parchment in there is a big asset. Just gently pull on the flaps of parchment hanging out and the whole thing will pop onto the cutting board. Next, using that long sharp knife cut into bars. 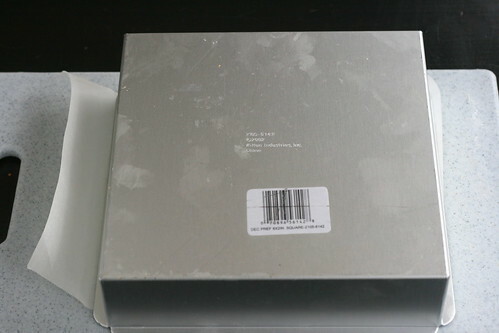 I get 12 out of an 8x8" pan. Lastly, you should wrap them up. While they hold together well enough to eat with your hands, they are "delicate" and will fall apart if they are messed with too much. Warmer weather also seems to make them more prone to falling apart. I use wax paper. I cut into pieces approximately 7" by 3" or so (I'm not very precise or concerned about it) and wrap them individually. If I have space to twist the ends closed I'll do that (easy!). If I've cut too short then I fold the ends in and seal shut with a sticker (cute!). Like I said before, these are pretty finicky. I make them the same way every time but my results still vary. It may depend on the weather. (Seriously). They are less dense now that we have warm weather. Also, it seems the ingredients require more moisture sometimes to get to that clumpy stage while mixing and other times it needs less. It's important to use the Quick Oats and not the regular ones. Regular oats will NOT gel together and you'll end up with a tasty granola crumble instead of handy granola bars. You can use regular Rice Krispies for the crisp rice cereal. But if you do that you should cut back on the brown sugar or they will end up being overly sweet. I use the organic brown rice cereal because we are trying to cut out all HFCS (high fructose corn syrup) and Rice Krispies have HFCS (and other sugars too, but it's the HFCS I have the biggest issue with). 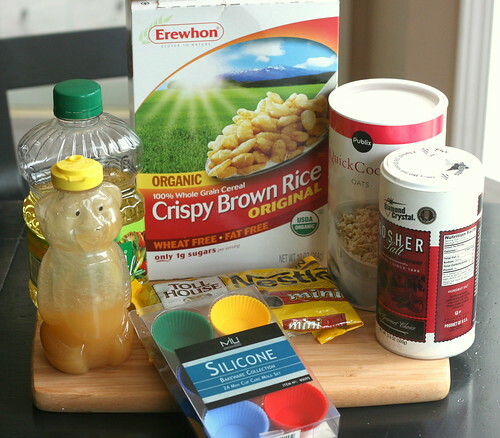 The organic brown rice cereal is not sweetened, so the whole 1/2 cup of brown sugar is needed. 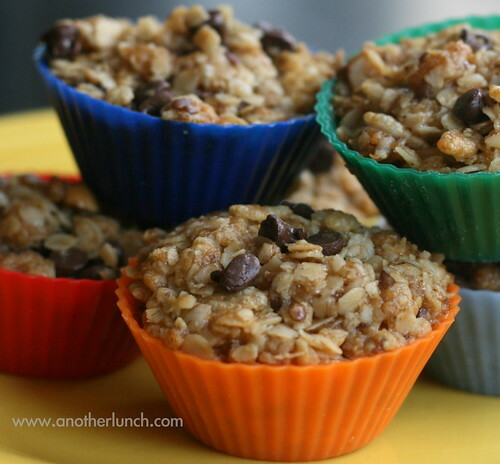 Substituting mini semi-sweet baking M&M's for the chocolate chips is fun way to change it up. You can add a little peanut butter to this if you like. Sometimes I'll add a big heaping spoonful in hopes of acclimating my son to the taste of it. ;-) As long as he doesn't know it's in there and I don't over-do it he doesn't notice. Sometimes he notices but doesn't complain too much. You can use butter instead of the canola oil if you prefer. I use the canola because it's a healthier oil/fat, but butter works just fine with the recipe too. 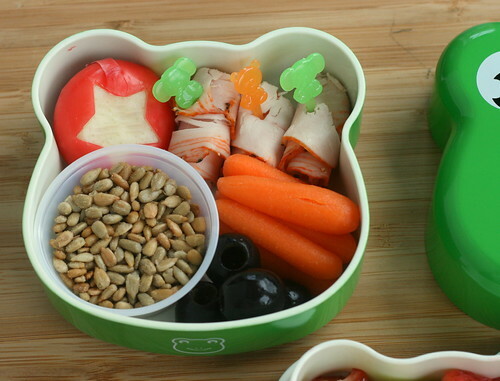 Cute snacks for two of my cute kids. 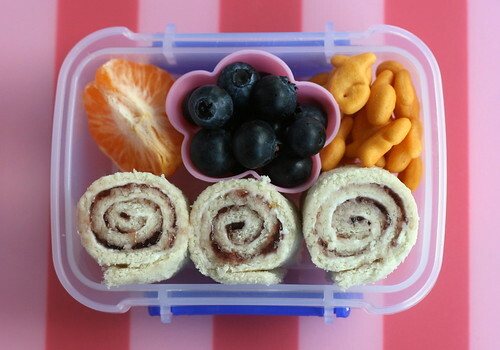 She had a "sushi sandwich" (cream cheese & grape preserves), baby fishie crackers, a tiny silicone cup of blueberries and a wedge of clementine. He had peppered turkey roll-ups, mini stars of cheddar cheese, blueberries, and a homemade granola bite. This week sees the Springtime mini-series theme continue with "seeds, plants, and flowers". 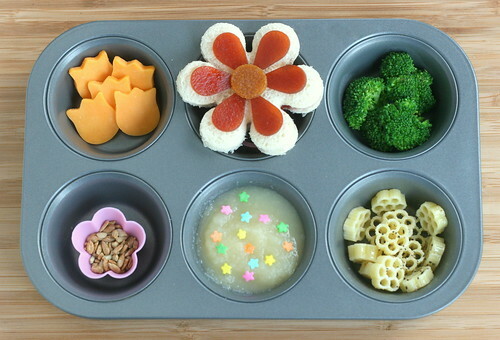 Bottom row: a pink flower cup with sunflower kernels, natural applesauce with flower sprinkles, flower shaped pasta drizzled with EVOO and lightly seasoned. Want to see some other MTM meals from today? 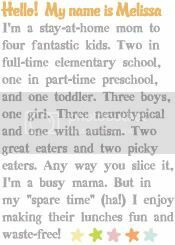 Check them out by clicking over to Muffin Tin Mom site here. 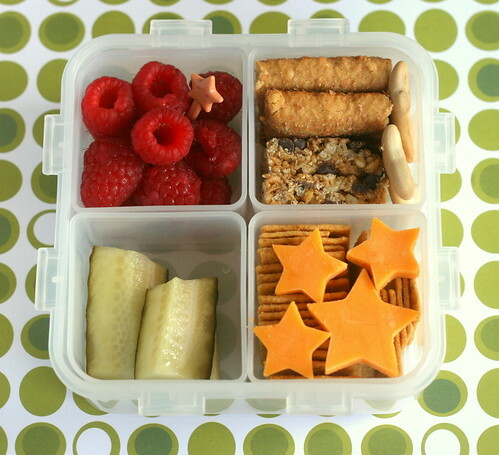 Clockwise from top left: raspberries, strawberry cereal bar/granola bar/animal cookies, wheat crackers and cheddar cheese stars, pickles. Packed in a four-square Lock & Lock box. My family loves elephants. Before we even had children, my husband and I would "adopt" an animal at the zoo, our sponsorship helping aid programs and projects at the zoo. We always chose the elephants! 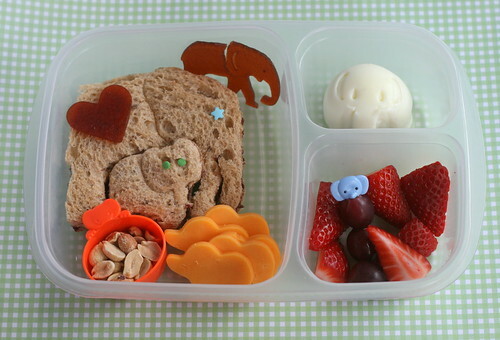 The elephant themed lunch my little girl enjoyed earlier this week. 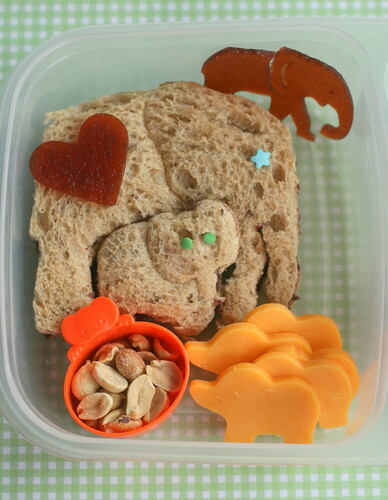 A jelly sandwich on whole grain bread, shaped into mommy & baby elephants with The Lunch Punch elephant sandwich cutter from the "Critter Cutters" set. Eyes are sprinkles. 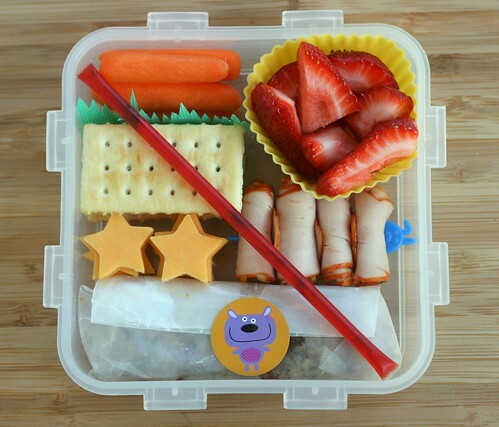 In the two smaller sections of this EasyLunchboxes container is an elephant-shaped boiled egg (shaped using this elephant onigiri shaper from JList) and some strawberries and grapes with a gratuitous elephant pick added for decoration. 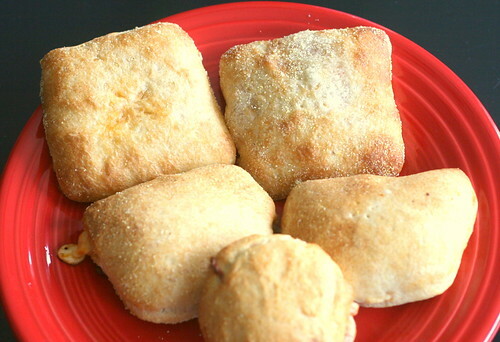 There are several variations to this recipe/technique to make homemade pizza pockets. You can take shortcuts to make the process easier and faster, or do it all from scratch - whatever suits your tastes (and time frame!) best. This is the (very!) 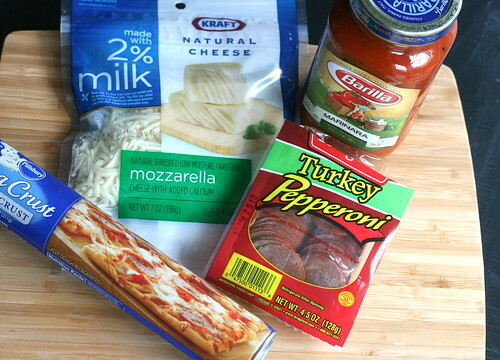 easy pizza crust recipe that I use most of the time (for all homemade pizza, not just pockets). It's simple, cooks up nicely, and is pretty forgiving. 1. Stir warm water, sugar and yeast together until dissolved. Let sit for a few minutes so the yeast has a chance to get bubbly and happy. Add the olive oil and the salt. Stir in the flour until well blended. Dough should be smooth and not overly sticky. You can knead the dough at this point, adding in small amounts of flour if needed to achieve a smooth dough. Leave dough to rest for 10 minutes. 2. lightly dust your working space with cornmeal to prevent sticking (you can use flour, but the cornmeal gives a nice crunch to the crust. I've found that sometimes too much flour residue leaves an icky floury taste to the crust). 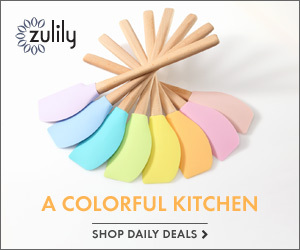 Gently, using a rolling pin (and your hands!) work the dough out until it is quite thin. The thinner the better! * If you have a bread machine you can also make a pizza dough in that. I just follow the basic recipe that is printed in our bread machine manual/cookbook. 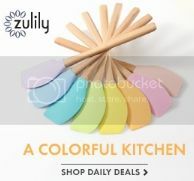 ** If you don't want to mess with making your own dough or crust at all you may check with your local bakery for dough. Even our Publix will sell fresh pizza dough out of the bakery department. You just have to ask for it and they bag it right up for you! *** If you want a really super short-cut you can buy pizza dough from the ready-to-go tubes. I'm happy that this pizza crust is free of trans fats. Of course you can use any sauce you like. I happen to love this one. My husband and I have been attempting to make our own marinara sauce for years and have been disappointed with the outcome time and time again. This one is my fall-back. I think it's great. Use whatever cheese you prefer. I usually buy large blocks of mozzarella from Costco or the bags of shredded Italian blend cheese with parmesan, romano and other yummy flavors (my fave). But this one was on a super sale so I deviated from my norm. There were two things I did differently this time that I think helped the pizza pockets turn out well. The first thing was I drained out some of the excess moisture from the marinara sauce. I just folded up a paper towel into four layers on a plate and them scooped about a 1/2 cup of sauce on top. After a few minutes the paper towels were soaking wet and the sauce was much thicker. Because the sauce wasn't so wet it didn't saturate the dough - allowing the crust to get a lot more crusty than I had before, also, none of the sauce ran out of the pockets! So with the dough laid out I gently pressed my outline of the pockets into the dough to give me a border to make sure the toppings were in the middle. 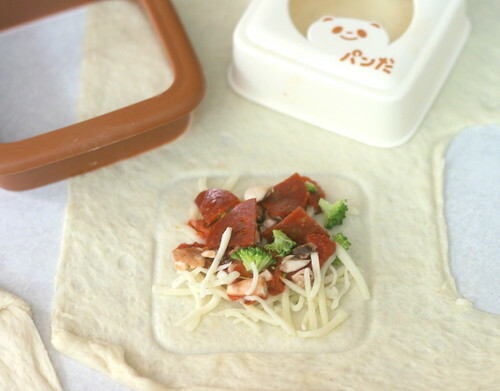 I used my sandwich sealer for this (you can find the same one on JList), but you could use anything for it - a large cookie cutter, a glass, etc. The sandwich sealer worked great for me because it sealed all the edges easily and in one motion. If you are using a regular cookie cutter you will need to press all the edges firmly with your fingers to seal closed. Poke a couple small holes in the top. I'm not exactly certain you need to do this, but I do anyway. Bake in a preheated oven at 400 degrees for about 8 minutes. KEEP AN EYE ON THEM!!! I set the timer for 6 minutes and then peaked in on them obsessively until they were golden brown. All ovens vary and depending on the temperature of your dough when it went in, the placement of them in the oven, what you are baking them on and the direction the wind is blowing outside, your cooking results may differ from mine! I baked mine on a pizza stone (our stone always lives on the bottom of our oven), but you can use a baking sheet too. Because I use cornmeal on the dough there is no sticking issues at all. But if you are making these without cornmeal you might want to use parchment paper or a very light spritz of baking spray on your baking sheet...I'd hate to think of the pizza pocket bottom being stuck to the tray! From that one tube of pizza crust I made these 7 pizza pockets and there was a small amount of dough left to make a small personal-sized regular pizza. Of course, your mileage may vary depending on the sizes of pizza pockets you make. I made some that were more square, and others I made more narrow. You might want to size and shape yours to fit the size lunchbox you are fitting it into. 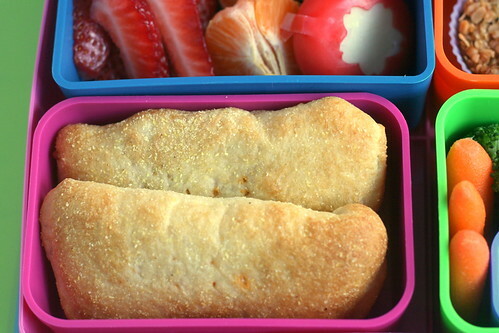 I can't tell you how many pizza pockets you'd be able to get out of the pizza dough recipe I posted above. What happens at my house is that we make the dough to make a big regular pizza for the whole family and I save back some of the dough to make pizza pockets out of for later. Just a few more days of 2nd grade left for my biggest boy! I was thrilled to discover our swizzle sticks fit in the EasyLunchboxes! They make such fun fruit kabobs. In the big section the strawberries lined up on a swizzle stick made for a nice barrier to the loose raspberries in the corner. On the other side are some grapes on picks and baby carrots. 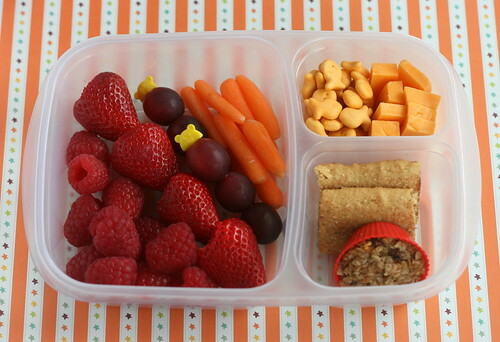 In the smaller sections are fishie crackers with cheddar cheese and a cereal bar with a homemade granola bite in a mini-silicone cup.